Jersey Airlines had an esprit de corps which marked it out from scores of other charter companies struggling to make their way in a postwar world. And it lasted the course where others fell by the wayside. There is, of course, something very special about being involved with an airline which bears the name of the place it serves; and there is no doubt that the hundreds of people who worked for Jersey Airlines between 1948 and 1963 felt they were part of a great enterprise. To build a company with flights throughout Europe was not the original aim of the founder, Maldwyn Thomas. He simply wanted to help a group of holidaymakers who asked him how to take a day-trip to France. Unwittingly, he started an airline that - through the 1950s - put Jersey firmly on the tourist map. Here is the story of that airline, which later added the title 'International' to its name. A story that, as Alastair Layzell explains, developed from small beginnings. A story that is taken up by Maldwyn Thomas's daughter, Louise Huelin, and his first pilot, Bernard Gardiner who saw it through from beginning to end. Every picture tells a story. 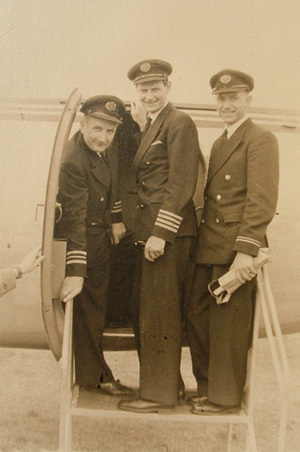 Bernard Gardiner (centre) John Bradley(left) and Flight Clerk Goodyear(right) on the steps of a de Havilland Heron.